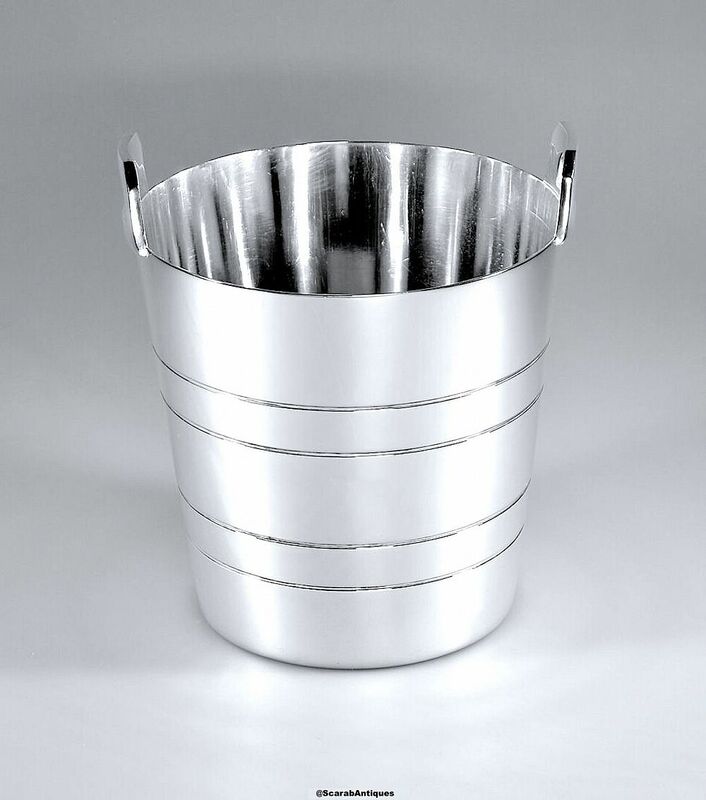 This marvellous silver plated ice bucket is by the English company Elkington. It has a very slight taper and the outside of each is decorated with four incised rings to give the impression of hoops. The handles are "D" shaped. It has an internal drainer or stand that in our opinion is possibly a later addition. The bucket has been engraved "La Reserve"
The base of the bucket is stamped 34087 Elkington Plate England and has two sets of marks for Elkington - this bucket has copper plate initials"E & Co" in a shield shaped cartouche "E & Co" in individual emerald cut shaped cartouches. There is also a further mark being a "V" in a shield shaped cartouche. This is the date mark for 1956. Very good externally - we have renewed the silver plate but there is some residual pitting to the internal base due to usage & wear that could not be removed. Internal drainer is possibly later addition.